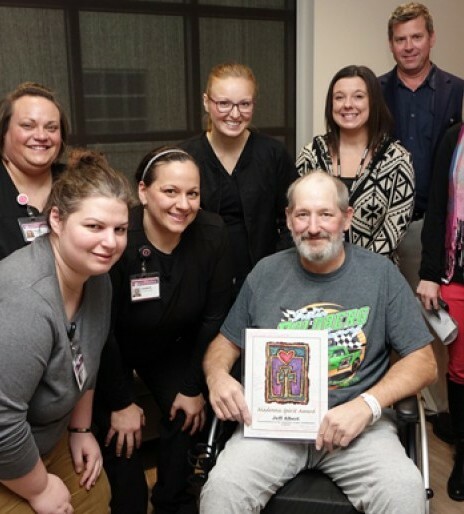 Jeff Albert was presented with a Spirit Award, a recognition given by his care team for his hard work and determination in his recovery. “Actually, just step foot in my house, so that will be nice,” said Jeff Albert. “I was stuck there for probably 10, 15 minutes, yelling for help," said Jeff. Jeff managed to turn the machine off as nearby co-workers heard his calls for help, careful to lift the heavy piece of equipment off of him. Taken by helicopter to Nebraska Medicine, Jeff immediately went into emergency surgery. He doesn't remember much, but described his first memory. “I was sitting there in bed and had these balloon things on my legs to keep them straight because they were both broke and I looked over at my daughter and I looked at my toes and I said, ‘What the heck happened to my toes?’ My toes were black,” said Jeff. Jeff suffered 48 fractures, an aneurysm and a punctured lung as a result of the accident. Coming to Madonna’s Omaha Campus to heal and get back on his feet. "They’ve got me climbing up stairs and stuff like that. Climbing into machines is going to be a task, but they’re doing a lot to help me figure out how I’m going to do it,” said Jeff. Through simulated grocery shopping trips in Independence Square and the use of specialty equipment like the driving simulator, Jeff’s working on reflexes, increasing his strength and stamina. He credits his care team as a big reason that he’s able to spend time with his new granddaughter and will soon be trading in his wheelchair for a walker. "It’s a very very good place. A lot of prayer here so that helps too,” said Jeff. “Your life can be taken away from you just like that and I could have laid there and gave up and said I’m never going to walk and work again, I don’t think I could just live there. You got a want to live,” said Jeff. Click here to learn more about Madonna's Complex Medical care.